Interesting article, and if you haven’t heard it, the Savages debut LP “Silence Yourself” was truly outstanding, and in G&A’s top five of last year. I spent a year being Jehnny Beth, night and day consumed by my persona, traveling the world and fronting Savages, doing my job the best I could. Bigger audiences pushed me to find the entertainer in me, stretch my ego, reach out to the other side of myself, then come back. It was a long and fascinating journey, not without its challenges. I drank too much, got ill, lost my voice and got depressed, until every mirror I faced seemed distorted and I lived 10 years in one. Then I came back to human size and gave my body a rest, stopped alcohol, coffee and cigarettes. I started swimming. 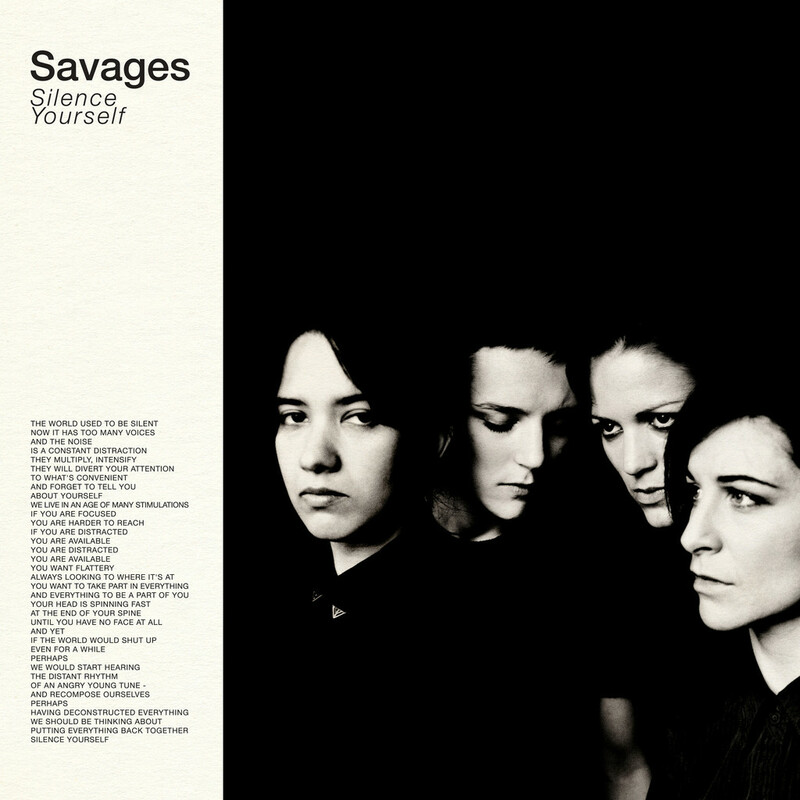 Good review of the Savage’s debut LP “Silence Yourself“, definitely on of the best albums of 2013. The dark songs come at you like a bulldozer and embrace you like a black octopus. Singer Jehnny Beth is a Patti Smith-meets-P.J. Harvey wailer; guitarist Gemma Thompson is a brutal executioner; bassist Ayse Hassan and drummer Fay Milton keep the ball rolling with often-weird time signatures, but you don’t even notice it. And that is where we can perhaps start to pull the thing apart, as that legacy was manifest in the headlining performance from a very in-form Savages. There is something extremely primal and female about them – they are both contained and unconstrained in equal measure. Decked out in their traditional all black, with just one lick of red (singer Jehnny Beth’s shoes), playing against a deep blood red curtain in front of the BFI’s main screen, they look like an installation representing female sexuality. This is a venue that probably better matches Savages’ art rock pretentions than many a bigger space.